Preheat the oven to 200 degree celcius. Line 12 muffin cups with paper liners or spray the muffin pan with cooking spray. In a large bowl, whisk together flour, sugars, baking powder and salt and keep aside. In medium bowl, whisk together melted butter, eggs, milk and vanilla extract, mixing until well combined. Make a well in the centre of the dry ingredients and pour the liquid ingredients into that well. Stir until ingredients are just combined-do not over mix the batter. Divide the batter into the prepared muffin pan. Bake for 17-20 minutes or until a toothpick inserted into the centre of a muffin comes out clean. Remove muffins to a wire rack and cool for atleast 5 minutes.. Cute and yummy cupcakes Shabbu. wow.. so cute looking muffins..
they look so cute and perfect. so yummy, soft and perfectly made. Wat a beautiful looking muffins, they came out super prefect. Chocolate chips muffins looks delicious and yummy. Hi Shabbu thanks for visiting my blog. Glad to follow you back...the muffins look great and it was interesting to know that you live in New Zealand....we would love to visit that country, love the photos that we see of that beautiful country....how do you like living there? great chocolate chips muffin, absolutely delicious!! 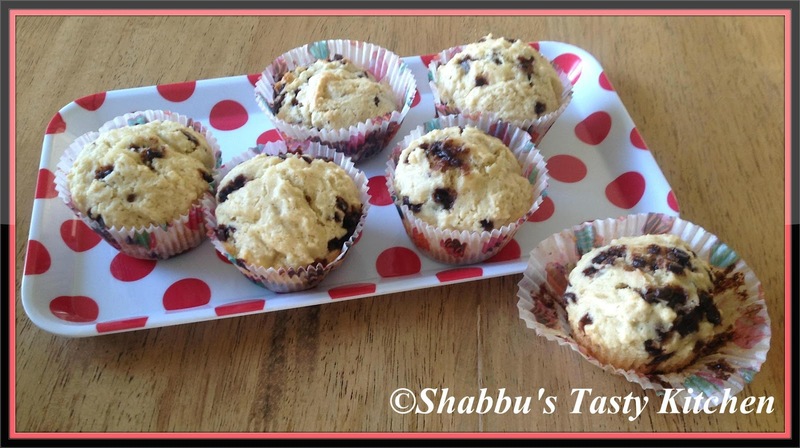 Yummy delicious muffins,lovely snack !! Kid friendly miffins! Looks yum!